Csound provides a large number of opcodes designed to assist in the distribution of sound amongst two or more speakers. These range from opcodes that merely balance a sound between two channels to one that include algorithms to simulate the doppler shift which occurs when sound moves, algorithms that simulate the filtering and inter-aural delay that occurs as sound reaches both our ears and algorithms that simulate distance in an acoustic space. First we will look at some methods of panning a sound between two speakers based on first principles. kPan should be a value within the range zero and 1. If kPan is 1 all of the signal will be in the left channel, if it is zero, all of the signal will be in the right channel and if it is 0.5 there will be signal of equal amplitude in both the left and the right channels. This way the signal can be continuously panned between the left and right channels. The problem with this method is that the overall power drops as the sound is panned to the middle. By doing this, the straight line function of the input panning variable becomes a convex curve, so that less power is lost as the sound is panned centrally. Using 90º sections of a sine wave for the mapping produces a more convex curve and a less immediate drop in power as the sound is panned away from the extremities. This can be implemented using the code shown below. The following example demonstrates all three methods one after the other for comparison. Panning movement is controlled by a slow moving LFO. The input sound is filtered pink noise. An opcode called pan2 exists which makes it slightly easier for us to implement various methods of panning. The following example demonstrates the three methods that this opcode offers one after the other. The first is the 'equal power' method, the second 'square root' and the third is simple linear. The Csound Manual describes a fourth method but this one does not seem to function currently. In the next example we will generate some sounds as the primary signal. We apply some delay and reverb to this signal to produce a secondary signal. A random function will pan the primary signal between the channels, but the secondary signal remains panned in the middle all the time. outs       asigL, asigR ;.... and output it..
3D binaural encoding is available through a number of opcodes that make use of spectral data files that provide information about the filtering and inter-aural delay effects of the human head. The oldest one of these is hrtfer. Newer ones are hrtfmove, hrtfmove2 and hrtfstat. The main parameters for control of the opcodes are azimuth (the horizontal direction of the source expressed as an angle formed from the direction in which we are facing) and elevation (the angle by which the sound deviates from this horizontal plane, either above or below). Both these parameters are defined in degrees. 'Binaural' infers that the stereo output of this opcode should be listened to using headphones so that no mixing in the air of the two channels occurs before they reach our ears (although a degree of effect is still audible through speakers). The following example take a monophonic source sound of noise impulses and processes it using the hrtfmove2 opcode. First of all the sound is rotated around us in the horizontal plane then it is raised above our head then dropped below us and finally returned to be level and directly in front of us. For this example to work you will need to download the files hrtf-44100-left.dat and hrtf-44100-right.dat (a place to download them may be here) and place them in your SADIR (see setting environment variables) or in the same directory as the .csd. So far we have only considered working in 2-channels/stereo, but Csound is extremely flexible at working in more that 2 channels. By changing nchnls in the orchestra header we can specify any number of channels but we also need to ensure that we choose an audio hardware device using -odac that can handle multichannel audio. Audio channels sent from Csound, that do not address hardware channels, will simply not be reproduced. There may be some need to make adjustments to the software settings of your soundcard using its own software or the operating system's software, but due to the variety of sound hardware options available, it would be impossible to offer further specific advice here. In order to send multichannel audio we must use opcodes designed for that task. So far we have used outs to send stereo sound to a pair of loudspeakers. (The 's' actually stands for 'stereo'). Correspondingly there exist opcodes for quadophonic (outq), hexaphonic (outh), octophonic (outo), 16-channel sound (outx) and 32-channel sound (out32). These opcodes only address very specific loudspeaker arrangements (although workarounds are possible) and have been superseded, to a large extent, by newer opcodes that allow greater flexibility in the number and routing of audio to a multichannel output. Note that channel numbers can be changed at k-rate thereby opening the possibility of changing the speaker configuration dynamically during performance. Channel numbers do not need to be sequential and unrequired channels can be left out completely. This can make life much easier when working with complex systems employing many channels. Using this method, it will only be required to change nchnls = ... in the orchestra header. In stereo mode, if nchnls = 2, at least all audio streams will be monitored, even if the results do not reflect the four channel spatial arrangement. So far we have referred to outs, outo etc. as a means to send audio to the speakers but strictly speaking they are only sending audio to Csound's output (as specified by nchnls) and the final destination will be defined using a command line flag in <CsOptions></CsOptions>. -odac will indeed instruct Csound to send audio to the audio hardware and then onto the speakers but we can alternatively send audio to a sound file using -oSoundFile.wav. Provided a file type that supports multichannel interleaved data is chosen (".wav" will work), a multichannel file will be created that can be used in some other audio applications or can be re-read by Csound later on by using, for example, diskin2. This method is useful for rendering audio that is too complex to be monitored in real-time. Only single interleaved sound files can be created, separate mono files cannot be created using this method. Simultaneously monitoring the audio generated by Csound whilst rendering will not be possible when using this method; we must choose one or the other. will render an interleaved, 24-bit, 4-channel sound file whilst simultaneously sending the quadrophonic audio to the loudspeakers. a1, a2, a3, a4   soundin   "4ChannelSoundFile.wav"
Vector Base Amplitude Panning1 can be described as a method which extends stereo panning to more than two speakers. The number of speakers is, in general, arbitrary. You can configure for standard layouts such as quadrophonic, octophonic or 5.1 configuration, but in fact any number of speakers can be positioned even in irregular distances from each other. If you are fortunate enough to have speakers arranged at different heights, you can even configure VBAP for three dimensions. The first number determines the number of dimensions (here 2). The second number states the overall number of speakers, then followed by the positions in degrees (clockwise). In the CsOptions tag, you see the option --env:SSDIR+= ... as a possibility to add a folder to the path in which Csound usually looks for your samples (SSDIR = Sound Sample Directory) if you call them only by name, without the full path. To play the full length of the sound file (without prior knowledge of its duration) the filelen opcode is used to derive this duration, and then the duration of this instrument (p3) is set to this value. The p3 given in the score section (here 1) is overwritten by this value. The circular movement is a simple k-rate line signal, from 0 to -360 across the duration of the sound file (in this case the same as p3). Note that we have to use the opcode vbap8 here, as there is no vbap7. Just give the eighth channel a variable name (a8) and thereafter ignore it. As VBAP derives from a panning paradigm, it has one problem which becomes more serious as the number of speakers increases. Panning between two speakers in a stereo configuration means that all speakers are active. Panning between two speakers in a quadro configuration means that half of the speakers are active. Panning between two speakers in an octo configuration means that only a quarter of the speakers are active and so on; so that the actual perceived extent of the sound source becomes unintentionally smaller and smaller. To alleviate this tendency, Ville Pulkki has introduced an additional parameter, called 'spread', which has a range of zero to hundred percent.2 The 'ascetic' form of VBAP we have seen in the previous example, means: no spread (0%). A spread of 100% means that all speakers are active, and the information about where the sound comes from is nearly lost. As the kspread input to the vbap8 opcode is the second of two optional parameters, we first have to provide the first one. kelev defines the elevation of the sound - it is always zero for two dimensions, as in the speaker configuration in our example. The next example adds a spread movement to the previous one. The spread starts at zero percent, then increases to hundred percent, and then decreases back down to zero. The last parameter ilayout refers to the speaker layout number. In the example above, instrument 1 uses layout 1, instrument 2 uses layout 2, and instrument 3 uses layout 3. Even if you do not have more than two speakers you should see in Csound's output that instrument 1 goes to all seven speakers, instrument 2 only to the first two, and instrument 3 goes to speaker 3, 5, and 7. Ambisonics is another technique to distribute a virtual sound source in space. There are excellent sources for the discussion of Ambisonics online3 and the following chapter will give a step by step introduction. We will focus just on the basic practicalities of using the Ambisonics opcodes of Csound, without going into too much detail of the concepts behind them. Ambisonics works using two basic steps. In the first step you encode the sound and the spatial information (its localisation) of a virtual sound source in a so-called B-format. In the second step you decode the B-format to match your loudspeaker setup. It is possible to save the B-format as its own audio file, to preserve the spatial information or you can immediately do the decoding after the encoding thereby dealing directly only with audio signals instead of Ambisonic files. The next example takes the latter approach by implementing a transformation of the VBAP circle example to Ambisonics. Input arguments are the monophonic sound source aSnd, the xy-angle kAzim, and the elevation angle which is set to zero. Output signals are the spatial information in x-, y- and z- direction (ax, ay, az), and also an omnidirectional signal called aw. The inputs for the decoder are the same aw, ax, ay, az, which were the results of the encoding process, and an additional iSetup parameter. Currently the Csound decoder only works with some standard setups for the speaker: iSetup = 4 refers to an octogon.4 So the final eight audio signals a1, ..., a8 are being produced using this decoder, and are then sent to the speakers in the same way using the outch opcode. What we have seen in this example is called 'first order' ambisonics. This means that the encoding process leads to the four basic dimensions w, x, y, z as described above.5 In "second order" ambisonics, there are additional "directions" called r, s, t, u, v. And in "third order" ambisonics again the additional k, l, m, n, o, p, q. The final example in this section shows the three orders, each of them in one instrument. If you have eight speakers in octophonic setup, you can compare the results. In theory, first-order ambisonics need at least 4 speakers to be projected correctly. Second-order ambisonics needs at least 6 speakers (9, if 3 dimensions are employed). Third-order ambisonics need at least 8 speakers (or 16 for 3d). So, although higher order should in general lead to a better result in space, you cannot expect it to work unless you have a sufficient number of speakers. Of course practice over theory may prove to be a better judge in many cases. This chapter gives an overview of the UDOs explained below. The channels of the B-format are stored in a zak space. Call zakinit only once and put it outside of any instrument definition in the orchestra file after the header. zacl clears the za space and is called after decoding. The B format of order n can be decoded in any order <= n.
The text files "ambisonics_udos.txt", "ambisonics2D_udos.txt", "AEP_udos.txt" and "utilities.txt" must be located in the same folder as the csd files or included with full path. These files can be downloaded together with the entire examples (some of them for CsoundQt) from here (as of September 2015). In the following introduction we will explain the principles of ambisonics step by step and write an opcode for every step. The opcodes above combine all of the functionality described. Since the two-dimensional analogy to Ambisonics is easier to understand and to implement with a simple equipment, we shall fully explain it first. Ambisonics is a technique of three-dimensional sound projection. The information about the recorded or synthesized sound field is encoded and stored in several channels, taking no account of the arrangement of the loudspeakers for reproduction. The encoding of a signal's spatial information can be more or less precise, depending on the so-called order of the algorithm used. Order zero corresponds to the monophonic signal and requires only one channel for storage and reproduction. In first-order Ambisonics, three further channels are used to encode the portions of the sound field in the three orthogonal directions x, y and z. These four channels constitute the so-called first-order B-format. When Ambisonics is used for artificial spatialisation of recorded or synthesized sound, the encoding can be of an arbitrarily high order. The higher orders cannot be interpreted as easily as orders zero and one. In a two-dimensional analogy to Ambisonics (called Ambisonics2D in what follows), only sound waves in the horizontal plane are encoded. The loudspeaker feeds are obtained by decoding the B-format signal. The resulting panning is amplitude panning, and only the direction to the sound source is taken into account. The illustration below shows the principle of Ambisonics. First a sound is generated and its position determined. The amplitude and spectrum are adjusted to simulate distance, the latter using a low-pass filter. Then the Ambisonic encoding is computed using the sound's coordinates. Encoding mth order B-format requires n = (m+1)^2 channels (n = 2m + 1 channels in Ambisonics2D). By decoding the B-format, one can obtain the signals for any number (>= n) of loudspeakers in any arrangement. Best results are achieved with symmetrical speaker arrangements. If the B-format does not need to be recorded the speaker signals can be calculated at low cost and arbitrary order using so-called ambisonics equivalent panning (AEP). x = r·cos(ψ) and y = r·sin(ψ). The 0th order B-Format of a signal S of a sound source on the unit circle is just the mono signal: W0 = W = S. The first order B-Format contains two additional channels: W1,1 = X = S·cos(ψ) = S·x and W1,2 = Y = S·sin(ψ) = S·y, i.e. the product of the Signal S with the sine and the cosine of the direction ψ of the sound source. The B-Format higher order contains two additional channels per order m: Wm, 1 = S·cos(mψ) and Wm, 2 = S·sin(mψ). In the Csound example udo_ambisonics2D_1.csd the opcode ambi2D_encode_1a produces the 3 channels W, X and Y (a0, a11, a12) from an input sound and the angle ψ (azmuth kaz), the opcode ambi2D_decode_1_8 decodes them to 8 speaker signals a1, a2, ..., a8. The inputs of the decoder are the 3 channels a0, a11, a12 and the 8 angles of the speakers. The B-format of all events of all instruments can be summed before decoding. Thus in the example udo_ambisonics2D_2.csd we create a zak space with 21 channels (zakinit 21, 1) for the 2D B-format up to 10th order where the encoded signals are accumulated. The opcode ambi2D_encode_3 shows how to produce the 7 B-format channels a0, a11, a12, ..., a32 for third order. The opcode ambi2D_encode_n produces the 2(n+1) channels a0, a11, a12, ..., a32 for any order n (needs zakinit 2(n+1), 1). The opcode ambi2D_decode_basic is an overloaded function i.e. it decodes to n speaker signals depending on the number of in- and outputs given (in this example only for 1 or 2 speakers). Any number of instruments can play arbitrary often. Instrument 10 decodes for the first 4 speakers of an 18 speaker setup. The left figure below shows a symmetrical arrangement of 7 loudspeakers. If the virtual sound source is precisely in the direction of a loudspeaker, only this loudspeaker gets a signal (center figure). If the virtual sound source is between two loudspeakers, these loudspeakers receive the strongest signals; all other loudspeakers have weaker signals, some with negative amplitude, that is, reversed phase (right figure). To avoid having loudspeaker sounds that are far away from the virtual sound source and to ensure that negative amplitudes (inverted phase) do not arise, the B-format channels can be weighted before being decoded. The weighting factors depend on the highest order used (M) and the order of the particular channel being decoded (m). The illustration below shows a third-order B-format signal decoded to 13 loudspeakers first uncorrected (so-called basic decoding, left), then corrected by weighting (so-called in-phase decoding, right). Example udo_ambisonics2D_3.csd shows in-phase decoding. The weights and norms up to 12th order are saved in the arrays iWeight2D and iNorm2D respectively. Instrument 11 decodes third order for 4 speakers in a square. In order to simulate distances and movements of sound sources, the signals have to be treated before being encoded. The main perceptual cues for the distance of a sound source are reduction of the amplitude, filtering due to the absorbtion of the air and the relation between direct and indirect sound. We will implement the first two of these cues. The amplitude arriving at a listener is inversely proportional to the distance of the sound source. If the distance is larger than the unit circle (not necessarily the radius of the speaker setup, which does not need to be known when encoding sounds) we can simply divide the sound by the distance. With this calculation inside the unit circle the amplitude is amplified and becomes infinite when the distance becomes zero. Another problem arises when a virtual sound source passes the origin. The amplitude of the speaker signal in the direction of the movement suddenly becomes maximal and the signal of the opposite speaker suddenly becomes zero. A simple solution for these problems is to limit the gain of the channel W inside the unit circle to 1 (f1 in the figure below) and to fade out all other channels (f2). By fading out all channels except channel W the information about the direction of the sound source is lost and all speaker signals are the same and the sum of the speaker signals reaches its maximum when the distance is 0. Now, we are looking for gain functions that are smoother at d = 1. 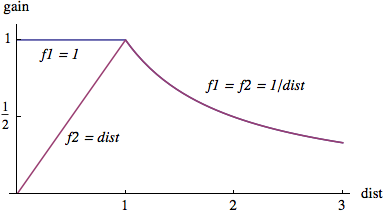 The functions should be differentiable and the slope of f1 at distance d = 0 should be 0. For distances greater than 1 the functions should be approximately 1/d. In addition the function f1 should continuously grow with decreasing distance and reach its maximum at d = 0. The maximal gain must be 1. 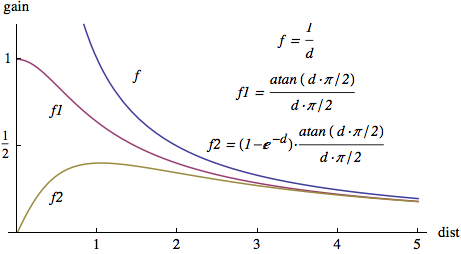 The function atan(d·π/2)/(d·π/2) fulfills these constraints. We create a function f2 for the fading out of the other channels by multiplying f1 by the factor (1 – E^(-d)). In example udo_ambisonics2D_4 the UDO ambi2D_enc_dist_n encodes a sound at any order with distance correction. The inputs of the UDO are asnd, iorder, kazimuth and kdistance. If the distance becomes negative the azimuth angle is turned to its opposite (kaz += π) and the distance taken positive. In order to simulate the absorption of the air we introduce a very simple lowpass filter with a distance depending cutoff frequency. We produce a Doppler-shift with a distance dependent delay of the sound. Now, we have to determine our unit since the delay of the sound wave is calculated as distance divided by sound velocity. In our example udo_ambisonics2D_5.csd we set the unit to 1 metre. These procedures are performed before the encoding. In instrument 1 the movement of the sound source is defined in Cartesian coordinates. The UDO xy_to_ad transforms them into polar coordinates. The B-format channels can be written to a sound file with the opcode fout. The UDO write_ambi2D_2 writes the channels up to second order into a sound file. /* these opcodes are included in "ambisonics2D_udos.txt"
The position of a point in space can be given by its Cartesian coordinates x, y and z or by its spherical coordinates the radial distance r from the origin of the coordinate system, the elevation δ (which lies between –π and π) and the azimuth angle θ. The channels of the Ambisonic B-format are computed as the product of the sounds themselves and the so-called spherical harmonics representing the direction to the virtual sound sources. The spherical harmonics can be normalised in various ways. We shall use the so-called semi-normalised spherical harmonics. 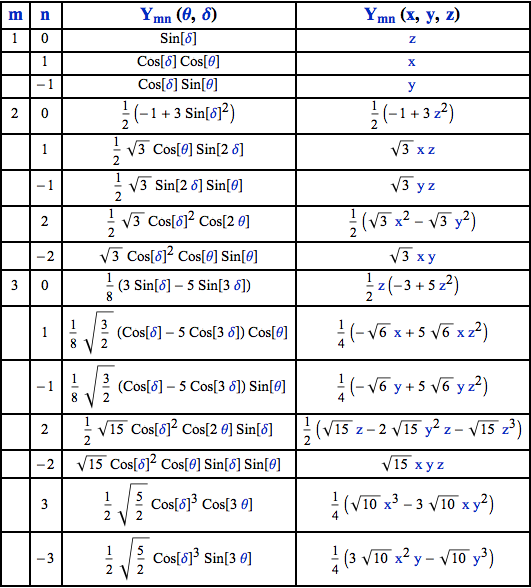 The following table shows the encoding functions up to the third order as function of azimuth and elevation Ymn(θ,δ) and as function of x, y and z Ymn(x,y,z) for sound sources on the unit sphere. The decoding formulae for symmetrical speaker setups are the same. In the first 3 of the following examples we will not produce sound but display in number boxes (for example using CsoundQt widgets) the amplitude of 3 speakers at positions (1, 0, 0), (0, 1, 0) and (0, 0, 1) in Cartesian coordinates. The position of the sound source can be changed with the two scroll numbers. The example udo_ambisonics_1.csd shows encoding up to second order. The decoding is done in two steps. First we decode the B-format for one speaker. In the second step, we create a overloaded opcode for n speakers. The number of output signals determines which version of the opcode is used. The opcodes ambi_encode and ambi_decode up to 8th order are saved in the text file "ambisonics_udos.txt". Example udo_ambisonics_2.csd shows in-phase decoding. The weights up to 8th order are stored in the arrays iWeight3D. ; the opcodes used below are safed in "ambisonics_udos.txt"
Example udo_ambisonics_3.csd shows distance encoding. In example udo_ambisonics_4.csd a buzzer with the three-dimensional trajectory shown below is encoded in third order and decoded for a speaker setup in a cube (f17). 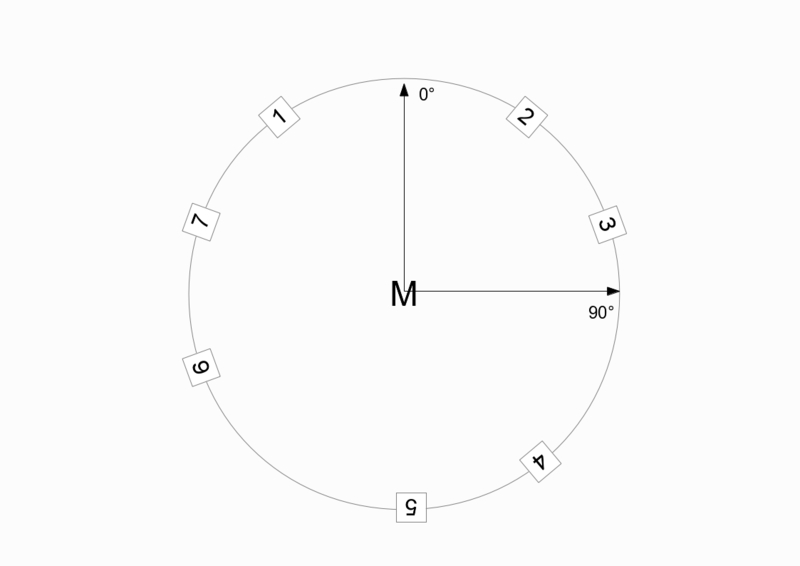 where γ denotes the angle between a sound source and a speaker and m denotes the order. 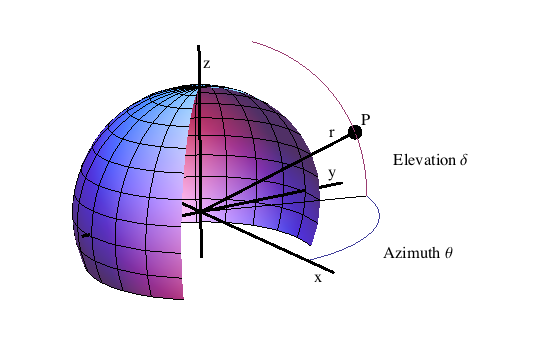 If the speakers are positioned on a unit sphere the cosine of the angle γ is calculated as the scalar product of the vector to the sound source (x, y, z) and the vector to the speaker (xs, ys, zs). 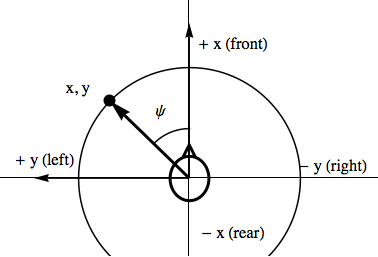 In contrast to Ambisonics the order indicated in the function does not have to be an integer. This means that the order can be continuously varied during decoding. The function can be used in both Ambisonics and Ambisonics2D. This system of panning is called Ambisonics Equivalent Panning. It has the disadvantage of not producing a B-format representation, but its implementation is straightforward and the computation time is short and independent of the Ambisonics order simulated. Hence it is particularly useful for real-time applications, for panning in connection with sequencer programs and for experimentation with high and non-integral Ambisonic orders. The opcode AEP1 in the example udo_AEP.csd shows the calculation of ambisonics equivalent panning for one speaker. The opcode AEP then uses AEP1 to produce the signals for several speakers. In the text file "AEP_udos.txt" AEP ist implemented for up to 16 speakers. The position of the speakers must be written in a function table. As the first parameter in the function table the maximal speaker distance must be given. dist_corr induces a delay and reduction of the speaker signals relative to the most distant speaker. radian (radiani) converts degrees to radians. Csound offers a simple and reliable way to access two standard methods for multi-channel spatialisation. Both have different qualities and follow different aesthetics. VBAP can perhaps be described as clear, rational and direct. It combines simplicity with flexibility. It gives a reliable sound projection even for rather asymmetric speaker setups. Ambisonics on the other hand offers a very soft sound image, in which the single speaker becomes part of a coherent sound field. The B-format offers the possibility to store the spatial information independently from any particular speaker configuration. The composer, or spatial interpreter, can choose one or the other technique depending on the music and the context. Or (s)he can design a personal approach to spatialisation by combining the different techniques described in this chapter.